Debbie--have you seen Jean Craighead George's THE TALKING EARTH? A librarian wrote to ask me about Jean Craighead George's The Talking Earth. Published in 1983 by HarperCollins, it is available in Spanish and Catalan. It is available as an audiobook, too. Most people who work in children's literature know that George's Julie of the Wolves won the Newbery Medal in 1972. Those of you who pay attention to depictions of Native people know that there is a lot wrong with Julie of the Wolves. I'll get a copy of The Talking Earth at the library. From what I see online, I anticipate there will be many problems with it, too. Elders who cross their arms when they speak to kids? Elders who sit cross legged on the ground? Not ok.
And the names! The main character is Billy Wind. Her sister is Mary Wind. Her father is Iron Wind. Her mother is Whispering Wind. Her grandfather is Charlie Wind. It was tied beside the airboat, a flat boat with a motorized fan that "blew" passengers across the saw grass in the watery prairie the Indians called the pa-hay-okee. Those are supposed to be Billy's thoughts but that sounds more like George herself, an outsider. Honestly, I don't want to read this book. American Indians in Children's Literature is pleased to bring you Joseph Marshall III's acceptance speech. He won the 2016 American Indian Youth Literature Award, middle school category for In the Footsteps of Crazy Horse. As is traditional amongst our communities, he was given a blanket. It is an outstanding book (see AICL's review) and I'm thrilled to learn, by email with Marshall, that he is working on a second book featuring Jimmy and his grandfather. Kids learn a lot of history by reading Marshall's In the Footsteps of Crazy Horse. I wonder what history we'll learn in the new book? Good afternoon. 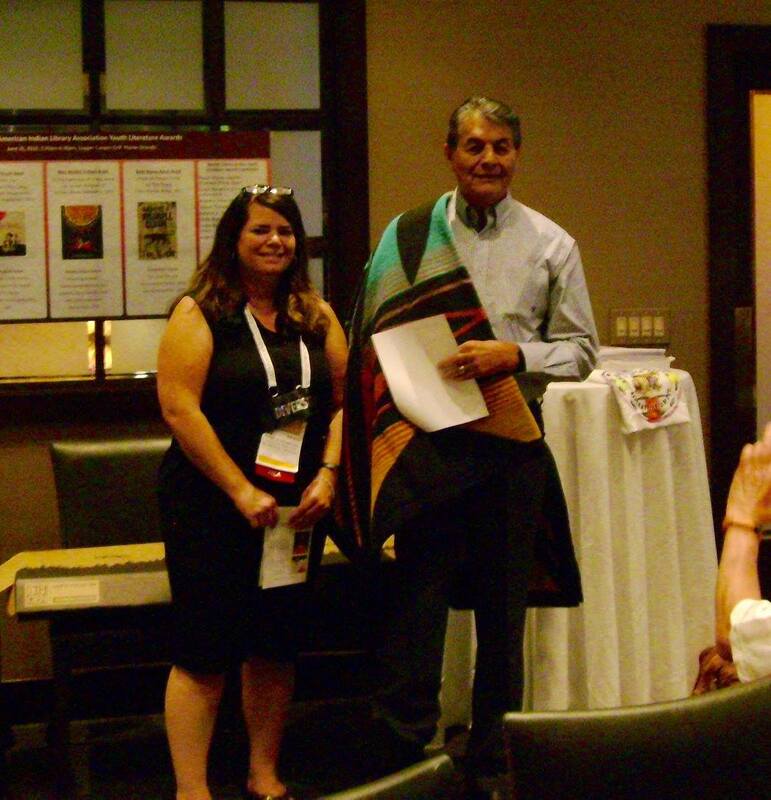 I can’t think of a better reason for my first ever trip to Orlando, than to accept this award from the American Indian Library Association. 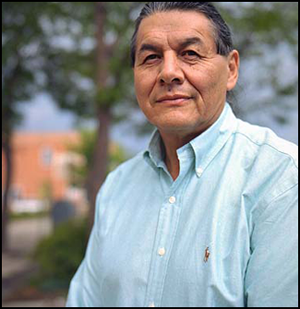 Thank you to AILA President Aguilar, and of course to the members of the 2016 American Indian Youth Literature Award jury. I am honored to receive this very special recognition, one that I will always treasure because it comes from my peers, and, of course, native librarians. Those of us who are native writers know that our purpose is to inform the non-native community about native history and culture, as well as our place in the world today. But just as importantly, if not more, we need to reconnect native young people with their own cultures. This award helps to further that effort. Thank you, of course, to my friends at Abrams and Amulet Books for publishing my book, to all of you who worked on it. I sincerely appreciate your contributions and your talents which definitely added to what this book is. The people who were the greatest influence on me, and taught me the art of storytelling, were primarily my maternal grandparents. 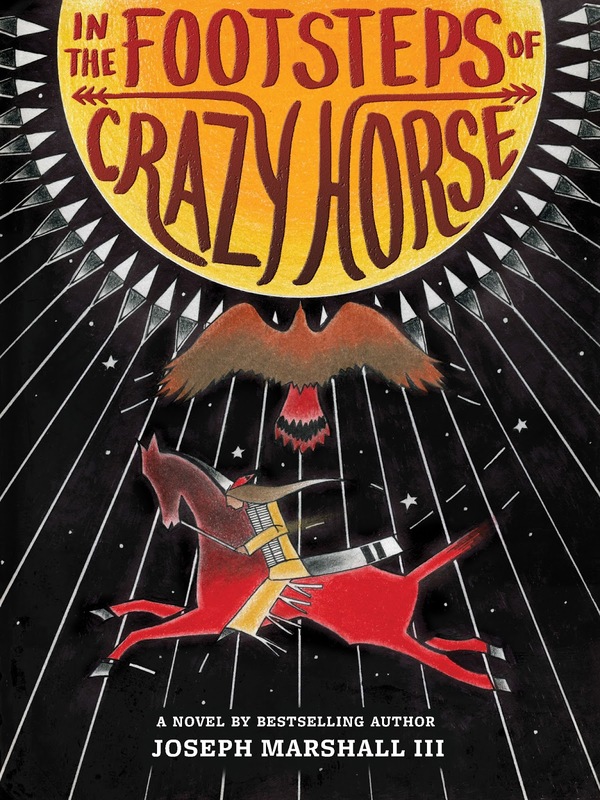 So the front story in In the Footsteps of Crazy Horse is a glimpse into my childhood on the Rosebud Sioux Indian Reservation, and of my wonderful relationship with my grandparents, but especially to my grandfather. Three special “thank yous,” the first to my editor Howard Reeves—my new best friend—for liking the concept for my book, but especially for your patience Howard. In the middle of working on the manuscript I had to ask for a delay when my wife became seriously ill. Howard was kind enough to grant a deadline extension. 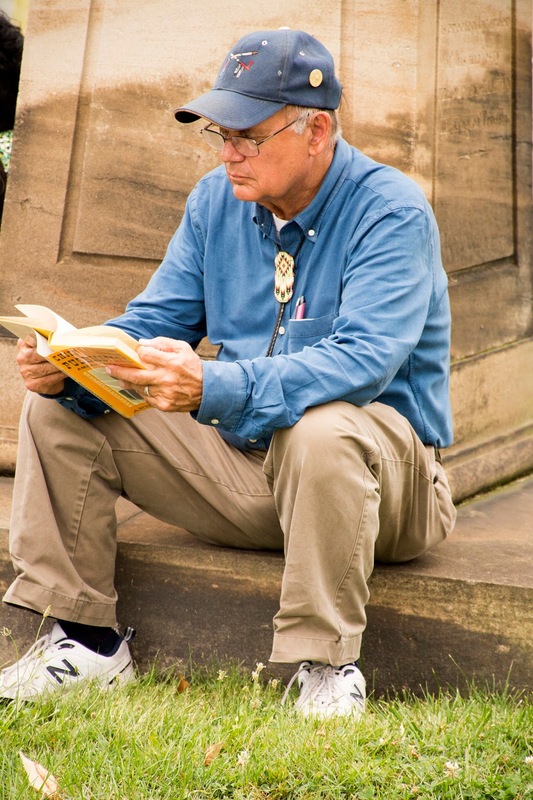 Another “thank you” to the phenomenally talented artist for his work on the book’s cover and inside illustrations—my good friend and fellow Lakota, Mr. Jim Yellowhawk. Finally, to the love of my life, my wife Connie, who was also my literary agent. It was she who insisted on the format for the book. Connie left us for the Spirit World on Valentine’s Day, three years ago, after putting up a valiant fight against colon cancer. Please know that, with this award, you are honoring her as well. So, as we say in my part of the world: Lila pilamayayapelo. Thank you, very much. Debbie and I are working on a book chapter, and my focus has been picture books on the Indian boarding schools. That’s taken me back to the first such book I encountered – Homer Little Bird’s Rabbit by Limana Kachel. I came across it in the Native American Educational Services (NAES) College bookstore in Chicago in the late 1980s, and was immediately charmed. The production values were not high, which was part of its appeal, for me. 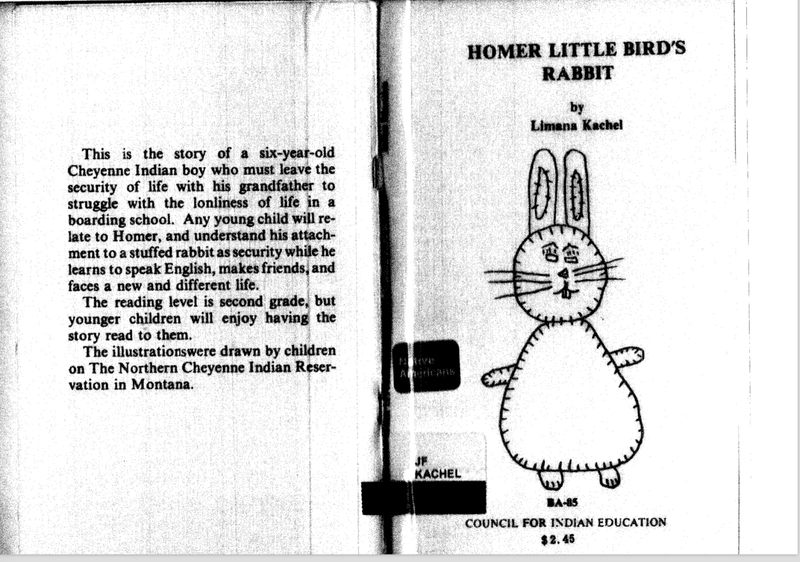 It was published by the Montana Council for Indian Education in 1983 (according to WorldCat; there is apparently no date on the book itself). It may not have been meant for distribution beyond the Montana state border. Its highly “individual” black line illustrations are by Northern Cheyenne children from the Lame Deer School and Labre Indian School! 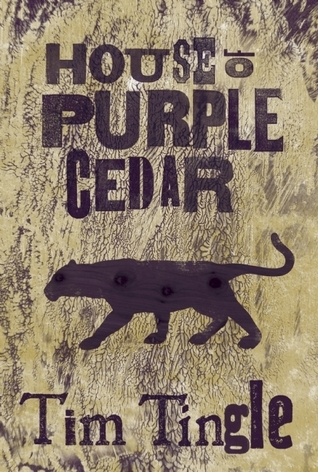 The writing is straightforward and engaging – comfortable to read aloud, and with an occasional dash of humor. And it shows a lot of insight into the minds of young children. It felt genuine. It still does. The book tells the story of 6-year-old Homer, a Cheyenne boy who must leave his beloved grandfather and, for reasons he doesn’t understand, go live at a school far away. On his first night there he cries inconsolably and a kind teacher named Miss Ring allows him to choose a stuffed animal as a comfort object. He picks a large pink rabbit, which he calls Rabbit. Soon Homer learns to use the playground slide and makes friends with Joe, another Cheyenne-speaking boy. When Homer takes Rabbit home for the summer, he is soon immersed in the things he loves to do there and forgets to keep track of his “friend,” who ends up in pieces under the porch. Homer feels terrible, but Grandfather saves the day. He uses the remnants of Rabbit as a pattern, cuts and stitches pieces of buckskin together, and adds a face. Rabbit is ready in time to go back to school with Homer, better than ever. At school he becomes famous and is known as The Cheyenne Rabbit. If other picture books about the boarding schools existed when my children were young (1970’s-1980s), we weren’t aware of them. My husband’s mother had been sent to a boarding school in Oklahoma at age 7. The experience was not positive. It was important to our family to find a book that could reflect at least part of that family story. Homer Little Bird’s Rabbit contains none of the harsh punishment, abuse, food deprivation, and other horrors that so many boarding school survivors have recounted. In fact, Homer has an adult ally (Miss Ring) and is permitted to have a stuffed animal. He also has time to play, and enjoys friendships with other Cheyenne children. When he and Joe speak Cheyenne, they are not punished. Even so, the story has the capacity to shock young listeners –at least, the ones I knew back then. When I read it aloud with my preschool-age sons and with a class of 5-year-olds, the children were aghast that a child could be forced to leave home and actually live at a school far away where he knew no one. These were white and interracial children with some degree of class privilege, who were already having anxiety about starting kindergarten and could not imagine having to go to school “away.” They understood Homer’s sorrow and fear, his glee when going down the slide, his joy when he reunited with his grandfather for the summer. They laughed when Rabbit got flatter and flatter each time he was laundered. They marveled at how Grandfather created a new and improved Rabbit. But it was hard for them to get their heads around the idea of being forced to go live at school. My sons understood it a little, partly because boarding school experience was part of their family story. They were also somewhat prepared for the next step in understanding, which was that often those schools were not good places for little kids. I like getting reacquainted with Homer. The book is psychologically on target with regard to childhood resilience. What helps Homer to ultimately thrive at school, while continuing to love and respect his grandfather and enjoy his home? Miss Ring, who understands the power of a transitional object (Rabbit); his Grandfather, who loves him unconditionally and who functions as touchstone; a friend (Joe) who literally speaks his language and shows him some of “the ropes”. Being able to maintain his Cheyenne identity at school without having to fight for it or go underground is also an important factor. I’m also looking at 3 other books, two of which are by Native writers. And I’ve thought a lot about what a boarding school picture book “should be”. How much should it tell/show young children? What will be believable to your young audience (and who is in that audience? ), and what will be overwhelming or over their heads? Homer Little Bird’s Rabbit is a story of childhood resilience, but not resistance. Homer’s school is a relatively benign place. He is overwhelmed at first, but not humiliated, starved, abused, or exploited while there. Resilience is important. Essential. But for many boarding school residents, so was resistance. Those 3 other books I mentioned are "about" resistance as a factor in resilience that subverts oppression. 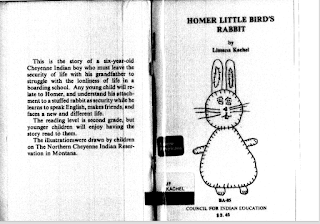 Do you, AICL readers, have some knowledge of Homer Little Bird’s Rabbit, or of its author Limana Kachel, or of the Council on Indian Education? Do you have a copy of the book? Mine has vanished – let’s hope it turns up now that I’m retired and can devote time to cleaning out my home office. Fortunately, Debbie was able to locate a colleague who scanned the book for us! Thanks!! If you’ve shared the book with kids, what was the response? What are your thoughts about it? Debbie--have you seen John Flanagan's THE GHOSTFACES? A reader wrote to ask me if I've seen John Flanagan's The Ghostfaces. I haven't, so am adding it to the "Debbie--have you seen" series. My head hurts just reading the synopsis. One red flag after another! It came out on June 14, 2016 from Penguin. According to Amazon, it is already #1 in its Kindle Store and in the Children's Books category, too, in the "Fairy Tales, Folk Tales & Myths/Norse." If I can get Flanagan's The Ghostfaces, I'll be back with a review.